Power Rangers costumes are still a big hit with kids. The incredible strength and skill depicted under these Mighty Morphin' characters' colorful costumes are hard for kids to resist--whether at Halloween or just for dress up and imaginary play. Available styles for Power Rangers costumes include Mystic Force, Time Force, Ninja Storm, Solaris Power, S.P.D., or Space Patrol Delta, and Dino Thunder. 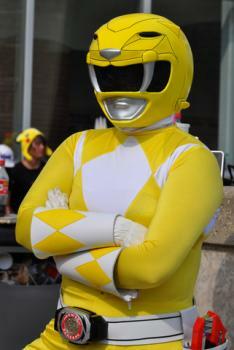 Power Rangers costumes vary widely in cost, depending on the style of costume and material. Costumes range from around ten dollars for a simple S.P.D. suit to approximately fifty dollars for a deluxe jumpsuit costume with a muscled torso. If you are buying the costume for one-time use, a lower-priced one might be your best bet. If you are purchasing the costume for dress up or imaginary Power Ranger play, or plan on having another child use the costume, you might consider going with a higher-quality costume that will hold up longer. In addition you can also purchase weapons specific for the Power Ranger, like the Blue Ranger's blue Tricera Shield. Power Rangers masks/helmets, tattoos, and Halloween treat sacks or pails are also available. The best money-saving option for buying Power Ranger costumes is to buy them at post-Halloween sales. During the days following Halloween, retailers are anxious to clear costumes out of their stores in preparation for their Christmas and holiday inventory. If it's already nearing Halloween, you can try discount and closeout stores, such as Big Lots, for reduced-price Ranger costumes. If your child has his or her heart set on being a certain Ranger, you may have to forego looking for a cheaper costume since you'll only have what's on the rack to choose from--and due to the Power Rangers' popularity, the costumes usually go quickly. In addition to discount stores, stores like Wal-mart, K-mart, and Target typically carry Power Ranger costumes. Party stores, costume stores, and card and party outlets are other venues. Online costume retailers often have the biggest selection of costumes and accessories, and you don't have to paw through racks or stacks of costumes to find the right size, Ranger color, and accessories. The tradeoff is the shipping fee and possibly higher cost. As with most purchases on the Internet, it pays to shop around. Some online shops may offer the same or similar costume at a considerably lower cost. Don't forget to check out auction sites like EBay--you may find a great deal on a barely worn Power Ranger costume.